San Juan Chamula, with its scenic streets, traditional architecture and indigenous people is one of the highlights of any visit to Chiapas. The church of San Juan is a popular site, with ornate wooden statues covered in tiny mirrors to ward away evil. Visitors will find a unique mix of Spanish Catholic traditions and old Mayan ways inside the church, which is free of pews and instead covered in carpets and pine boughs. As many healing ceremonies as Sunday services take place here. A local market showcases traditional clothing, blankets and items from Zapatista. Travelers say it’s best to hire a guide to explore this town, since locals are suspicious of visitors and protective of age-old traditions and indigenous ways. San Juan Chamula is located 10 kilometers from San Cristobal de las Casas. Approximately 99.5 percent of people here speak an indigenous language—typically Tzotzil. 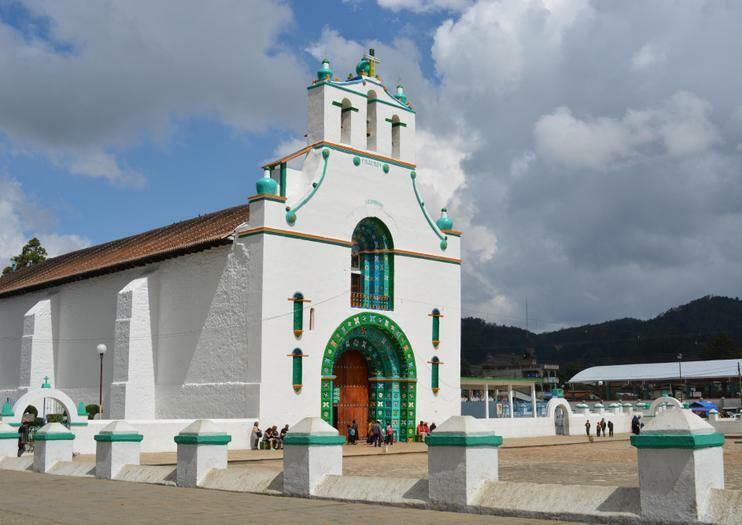 Travelers hoping to get off the tourist track and experience indigenous culture up close will enjoy this trip to the villages of Chamula and Zinacantan. The day begins with a visit to a local family Zinacantán to learn about pre-Hispanic weaving and tortilla-making, and taste the traditional drink, Pox. The next stop is the Mayan village of San Juan Chamula, where you’ll experience a shaman ritual in the native Tzotzil language. Let a guide navigate and translate for you on a day trip to 2 indigenous villages in Chiapas. On walking tours of each town, gain an understanding of indigenous culture and tradition you won’t find in guidebooks. After visiting an artisan market, sit down with a local family for a meal of fresh tortillas, beans, and organic coffee. Round-trip transport from San Cristobal is included for your convenience.